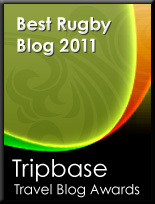 TOTAL FLANKER...a rugby blog: So what’s all the fuss about…? My prevaricating over the decision about whether or not to make a rugby playing comeback at the age of 42 (or 43, as I’ll be soon after the season starts in September) is starting to look a little pathetic. Not only have there been players daft enough to continue playing into their nineties, but I’m now consistently finding evidence of players who in fact didn’t take up the game at all until they were in their forties. 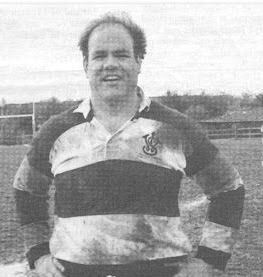 One such lunatic is Wes Clark, who not only didn’t begin playing until he was 42, but also embraced the game with such passion that he is the author of the excellent eclectic website The Rugby Reader’s Review and well as being the webmaster for his club’s (Western Suburbs RFC) website. You’d think that after that Wes might have been put off but no, in September he was still there, making his debut for the Western Suburbs Old Boys (or Veterans as we call them this side of the pond) in the second row. And that’s where he’s remained, turning out regularly for the SOBs and the B-side and becoming an indispensable club stalwart while contributing a huge amount of rugby content on the web. Even more remarkable is that Wes didn’t like, and so didn’t play, sport as a kid. His conclusion that “rugby took a middle aged guy who was on the fast track to depression, and it gave me my smile back” is pretty poignant and a reminder about what a great sport we have. There are other exam ples – for instance the Boston Globe tells the story of how Dr. Thomas Durant was introduced to rugby at the age of 47 by his son, Steven, and how he then continued to play for the Boston Irish Wolfhounds club until he was 70, eventually playing in the same team as his son and his 15 year old grandson. And as for comebacks, Rugby Readers Review features the account of Dan Holden who decided to make a comeback aged 45 after a 23 year absence from the game, despite the reaction from his 13 year old daughter. “You’ll get killed,” she said. He’s right. That’s what’s pulling me towards a decision to play again. It’s a heart over head thing I guess (obviously the rational thing to do would be to remain welded to the sidelines with beer in hand). Strangely, all of the above examples feature Americans and I must admit I haven’t heard of a Brit taking the game up in middle age. Perhaps we do our mid-life crises a bit differently over here, but I suspect that the reason is that by and large rugby isn’t (or hasn’t been) something that American kids play and so is taken up mostly when people get to college or later in life. Americans therefore choose to play rugby rather than get pushed into it as kids and are therefore that much more enthusiastic and passionate about the game (much like women who take up rugby over here). The Story of Dr. Durant was REALLY inspiring. What an amazing man-not just about picking up rugby at an advanced age, but what he did to try to make the world a better place in which to live. It's humbling how much feedback I have gotten on my web-posting. Thanks to that posting, I have been able to meet some phenomenal people in the blogosphere.